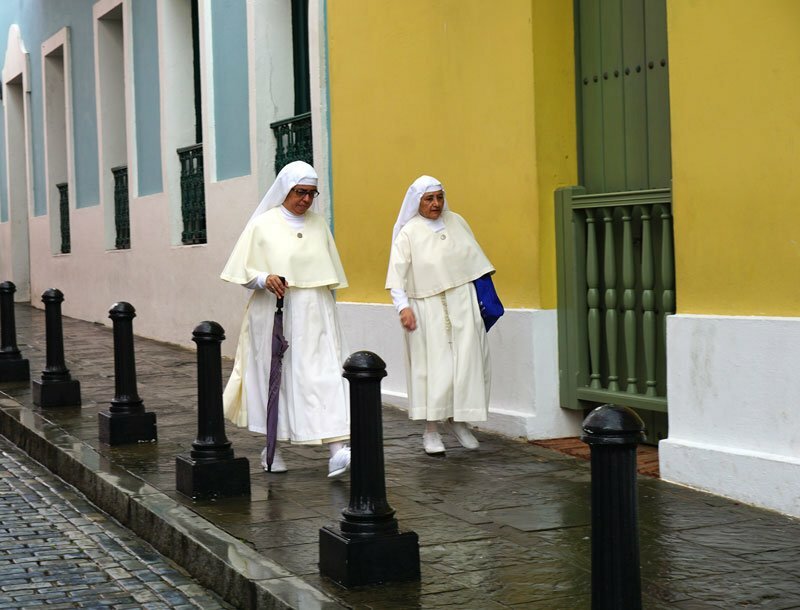 If there’s one word that captures the essence of Old San Juan, Puerto Rico, that’s it. The city is full of color. Colorful buildings. Colorful food. Colorful people. We spent a day in the city at the end of our recent Caribbean cruise on the Viking Sea. 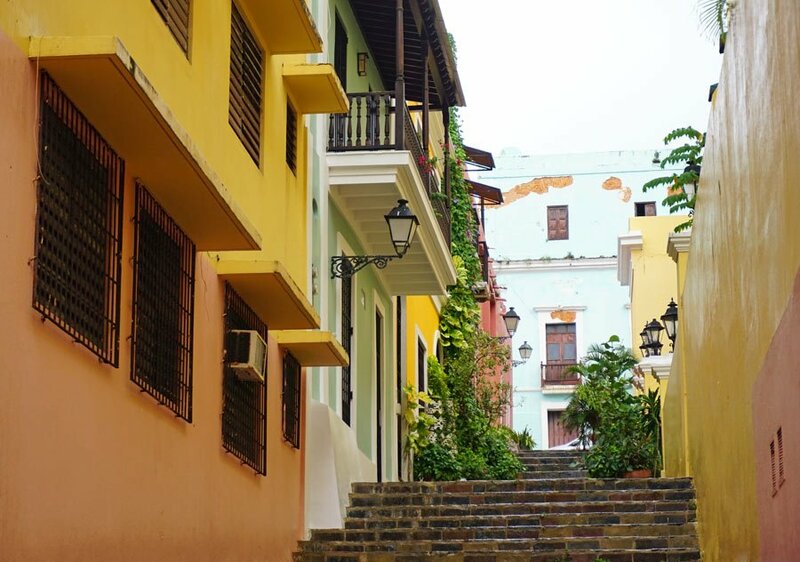 Remembering the news about how Hurricane Maria devastated Puerto Rico, we weren’t sure there’d be too many things to do in Old San Juan. So it was a big eye-opener to see the city full of life and bustling like normal. We had to look hard to spy remaining evidence of hurricane damage. Restaurants and shops are open. Buildings have been repainted and re-roofed. 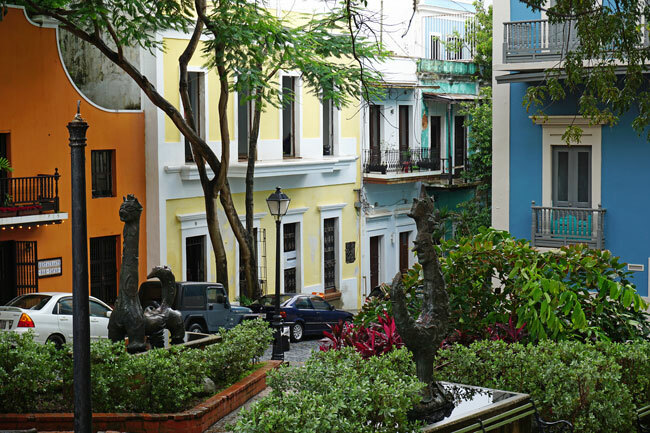 In-the-know tourists are enjoying Old San Juan’s attractions and its comeback. 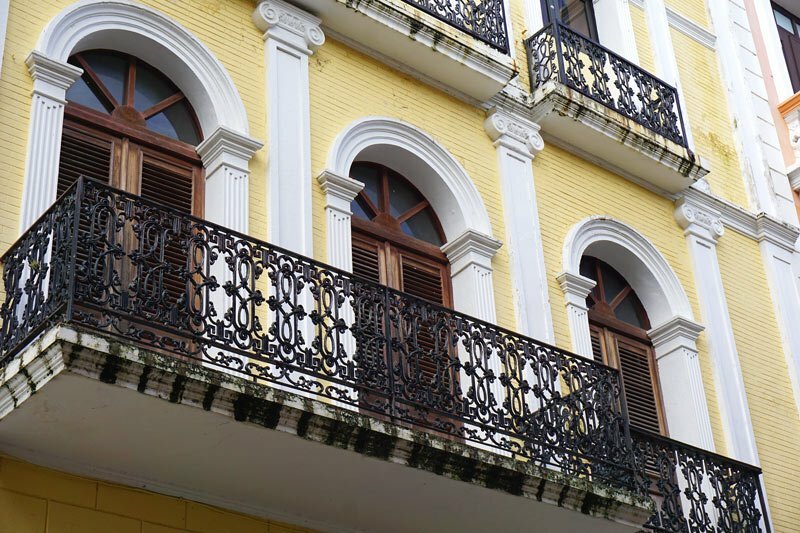 Indeed, visiting Old San Juan turned out to be one of the best days on our cruise! 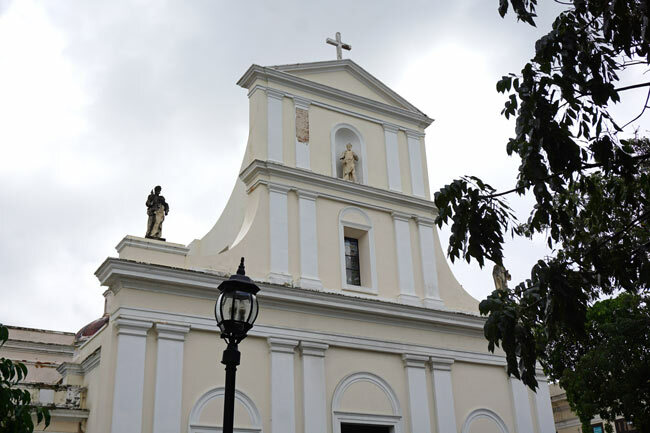 Founded by Spanish colonists back in 1521, San Juan is the second oldest European-established capital in the Americas. The old fortified city (partially encircled by an ancient wall) is a UNESCO World Heritage Site. 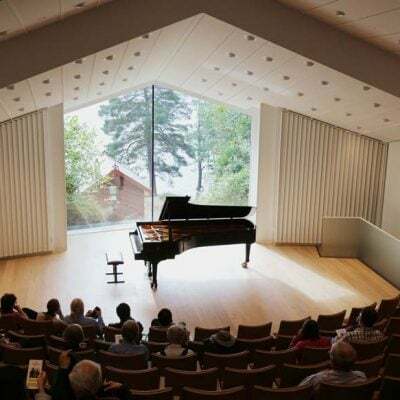 It’s quite compact, comprising some seven square blocks, so you can easily see everything in a day. 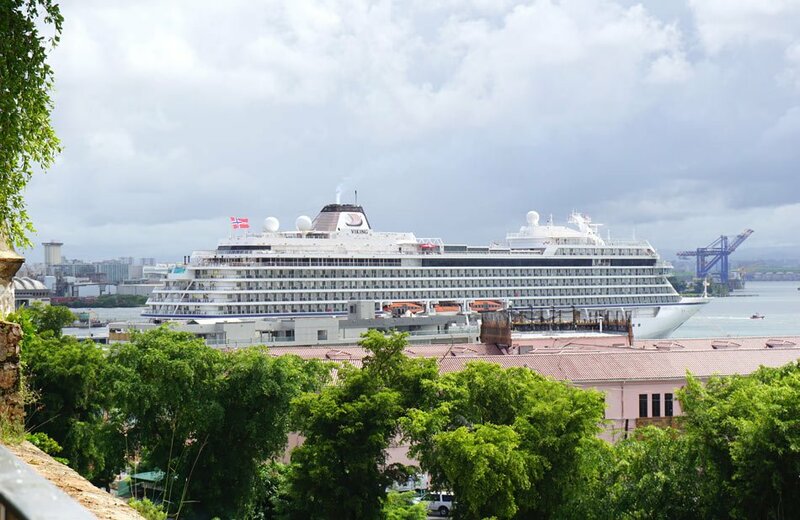 What’s particularly convenient for cruise passengers is that the cruise port is right in Old San Juan. Simply walk off your ship, and you have the old city right at your fingertips to explore. 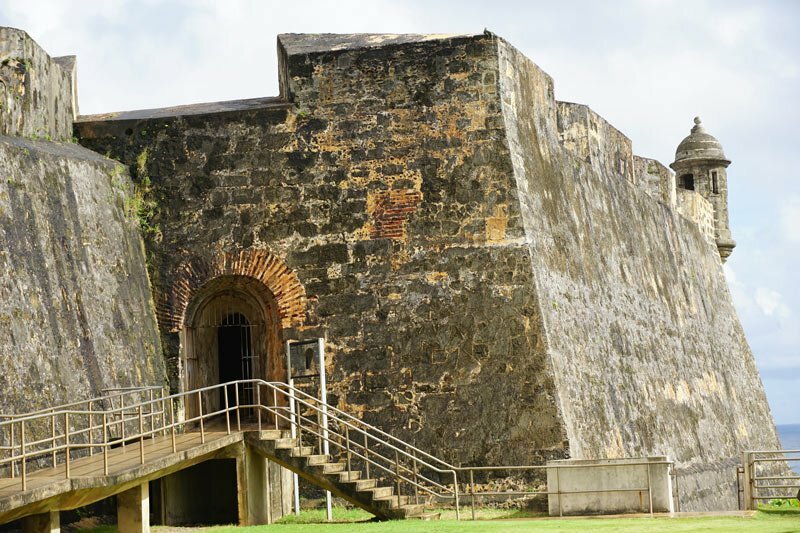 Most people have heard of the military fort, El Morro – probably the most famous of Old San Juan’s attractions. But there are actually two impressive forts you should see. 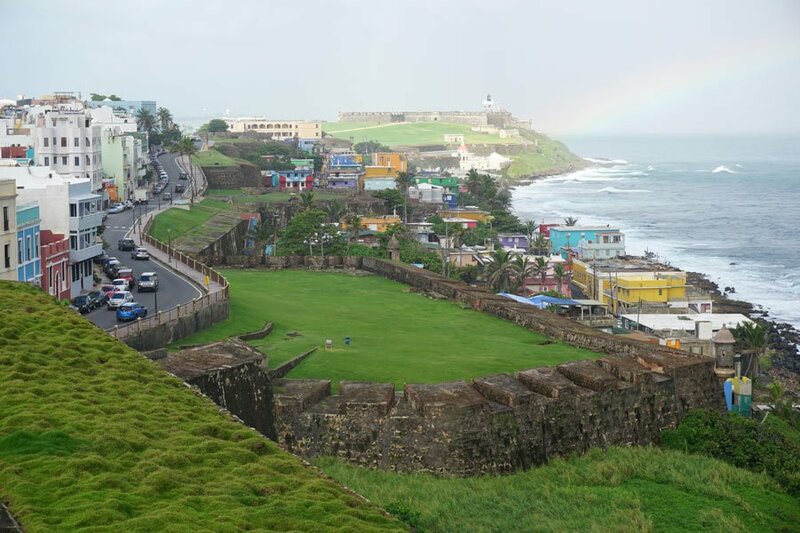 Saint Christopher’s Castle (Castillo de San Cristobal) is the other younger fort, built between 1765 and 1785 to protect the city from a land invasion. 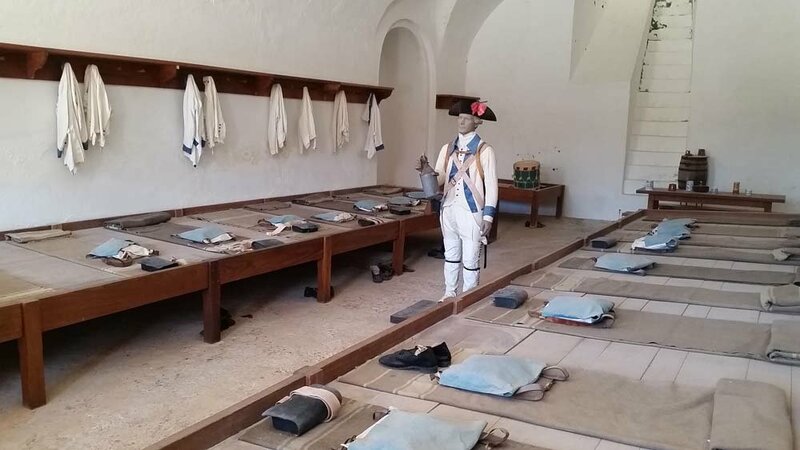 The castle fortress is operated today by the U.S. National Park Service, so there’s a small entrance fee ($7 gets you into both this fort and El Morro). 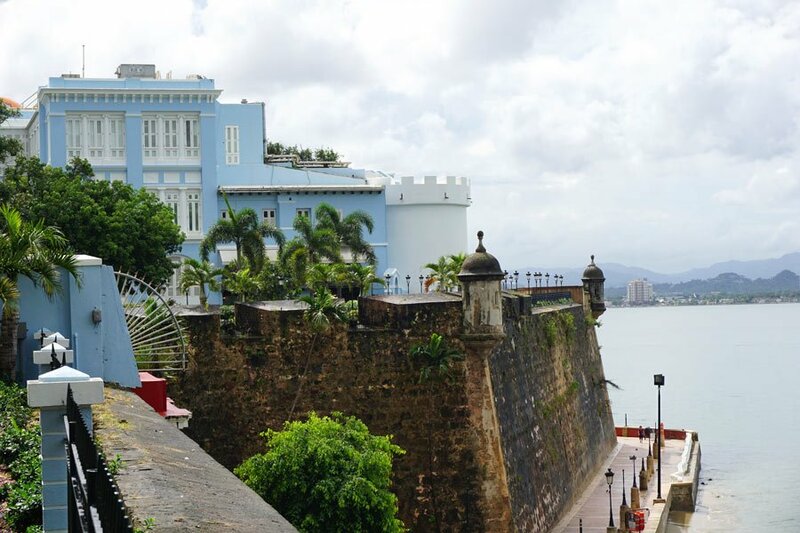 Walk the parapets, take in the beautiful views of Old San Juan below (can you see your cruise ship? ), hold a bayonet in the soldier’s barracks and squeeze through dark tunnels burrowing below the fort (one tunnel leads to a dungeon). The Old City’s cobblestone streets, lined by colonial churches and buildings, are made for walking. We joined a complimentary guided walking tour, organized by our ship, which helped orient us and fill us in on the city’s history. But with a map (even without one), you can get around on your own. 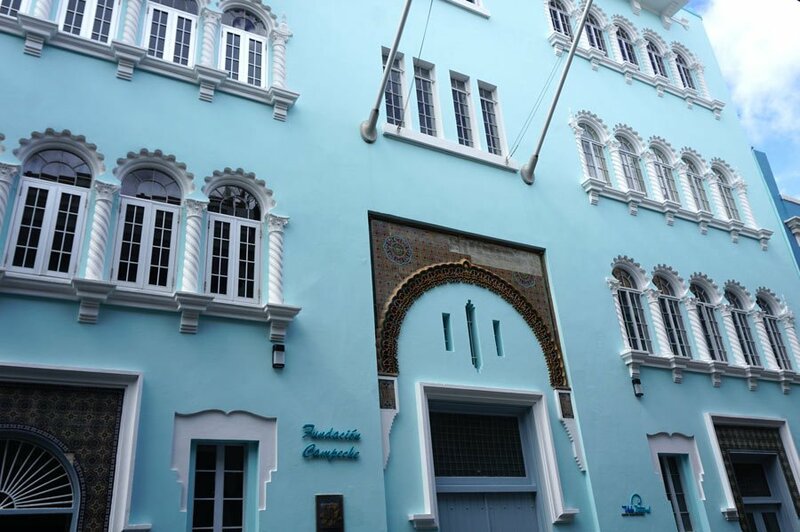 Fortaleza Street is one of the prettiest streets. You can’t help but notice all the pink, purple, green and yellow umbrellas floating above the street. 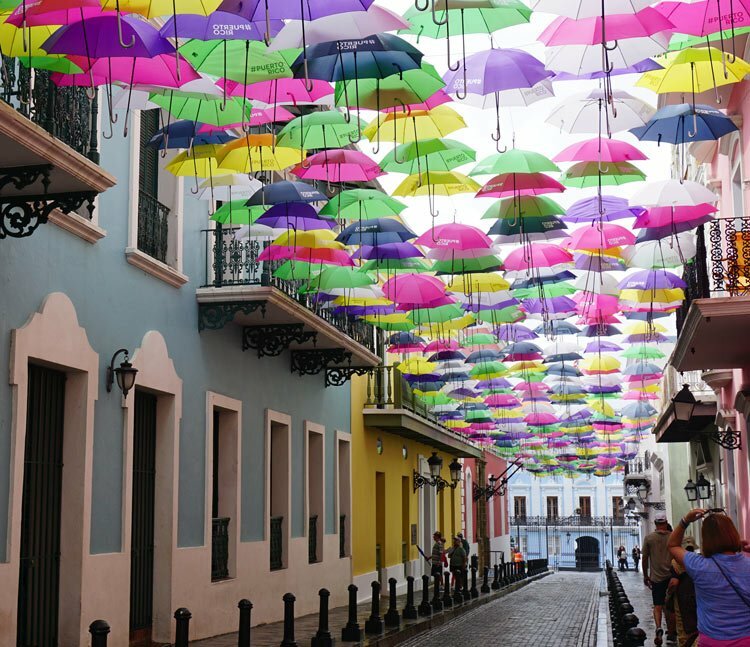 It’s a new art installation, known as the Umbrella Sky Project, intended to bring color back into the lives of the people after the hurricane. 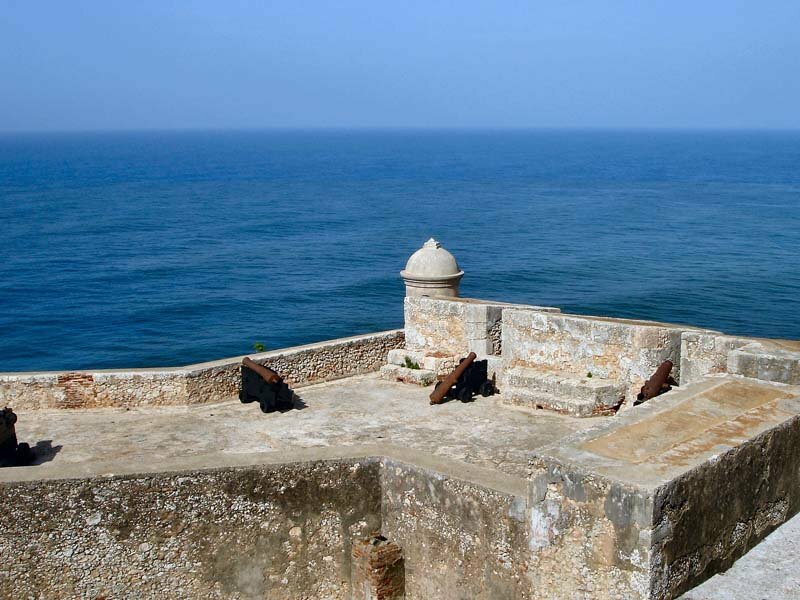 At the end of Fortaleza Street, you reach the 16th century governor’s mansion known as La Fortaleza (or Palacio de Santa Catalina). 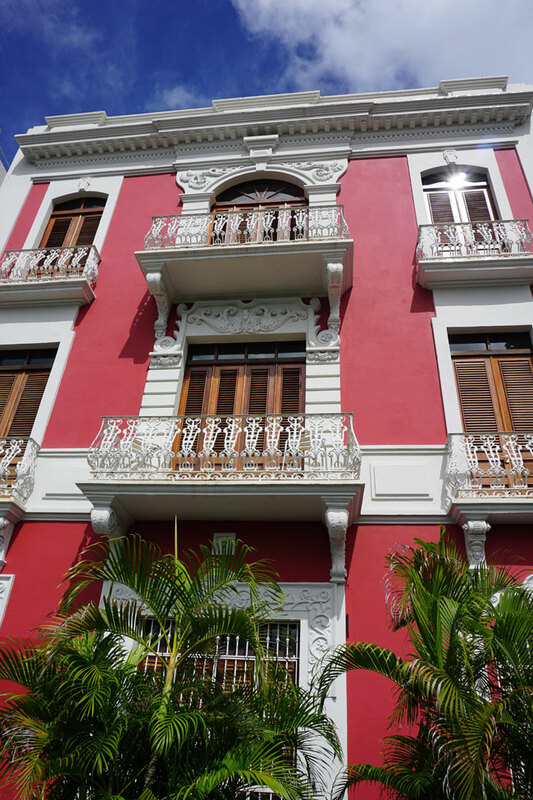 The frothy blue-and-white confection, with its tiled roof and lots of wrought iron curlicues, has housed every Puerto Rican governor since Juan Ponce de Leon. Oh, and have a look at the cobblestones on the streets themselves. Do you notice that they’re blue? Called adoquines, these cobblestones were the blocks of ballast (made from the waste of iron smelting) placed in the early ships that sailed over from Spain. 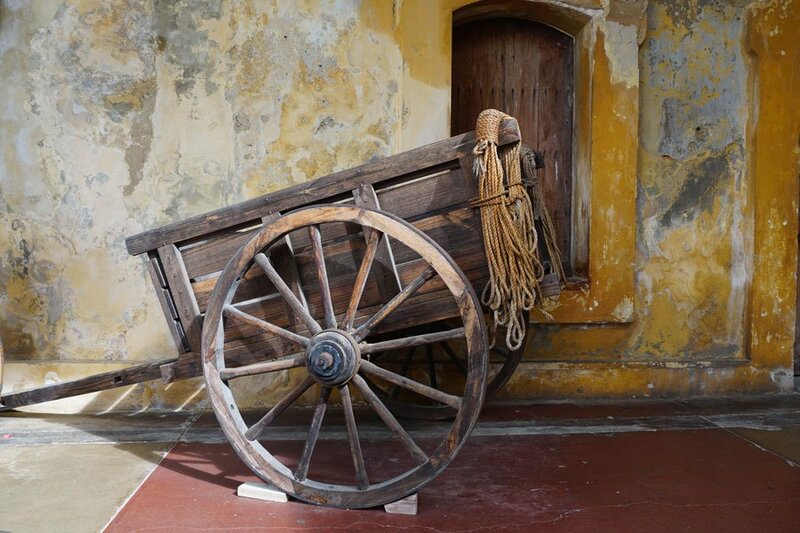 When the ships reached San Juan, the ballast was dumped and replaced with gold, which was taken back to Spain. 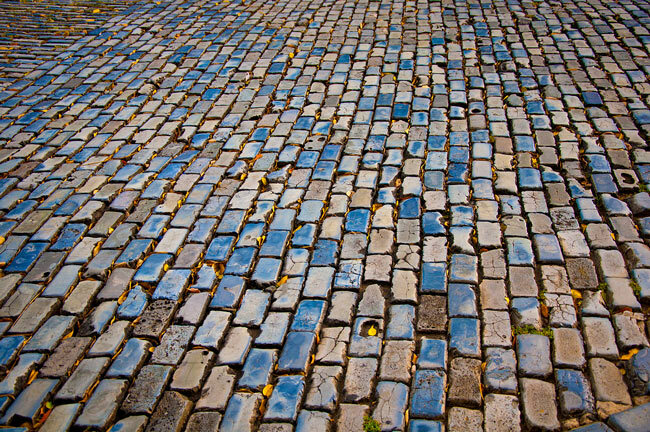 And the streets of Old San Juan were paved with the ballast. 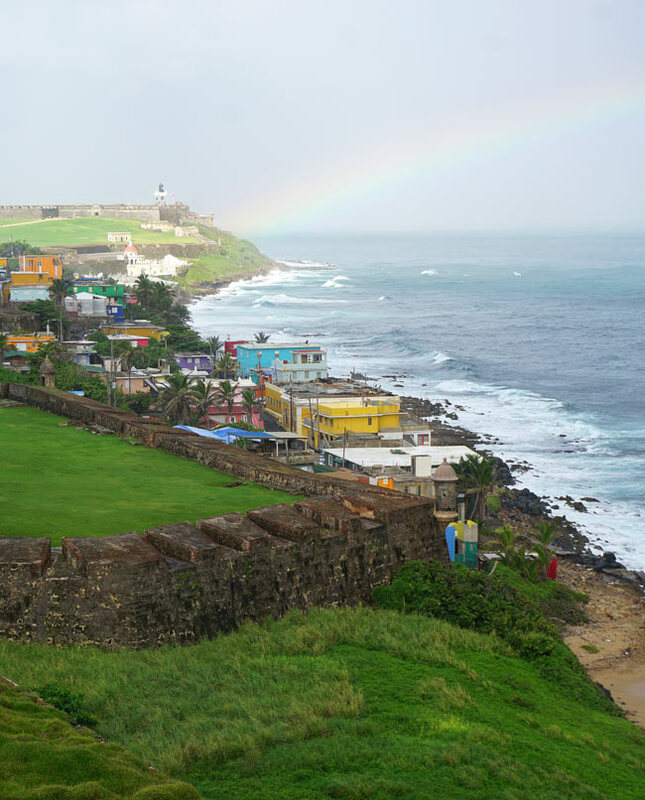 In the late afternoon, we headed out into town again and walked along the seaside path that leads to El Morro (Castillo de San Felipe del Morro). 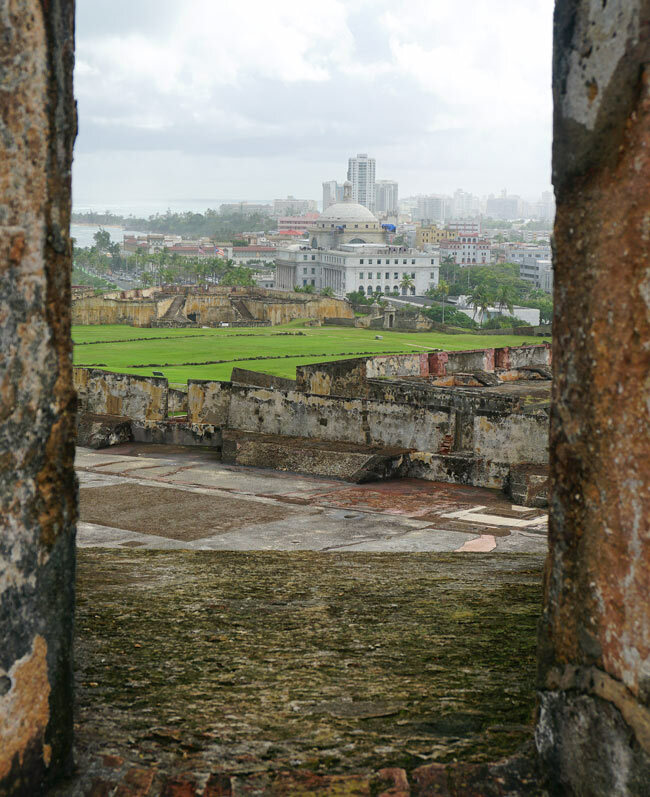 Perched on the northwest tip of Old San Juan, it was constructed to protect the city against attacks from the sea. And it’s the older of the city’s forts – dating back to 1539. Divided into six levels, the imposing citadel includes dungeons, storerooms, barracks, ramps and towers. 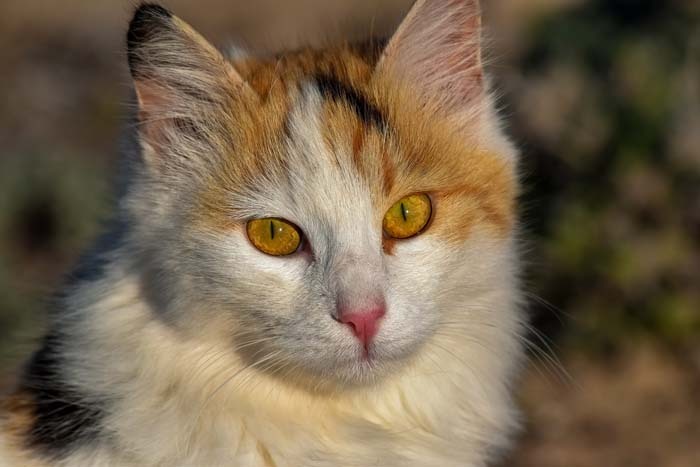 One curious (and cute) thing we noticed on the grounds around El Morro was all the wild stray kitties. 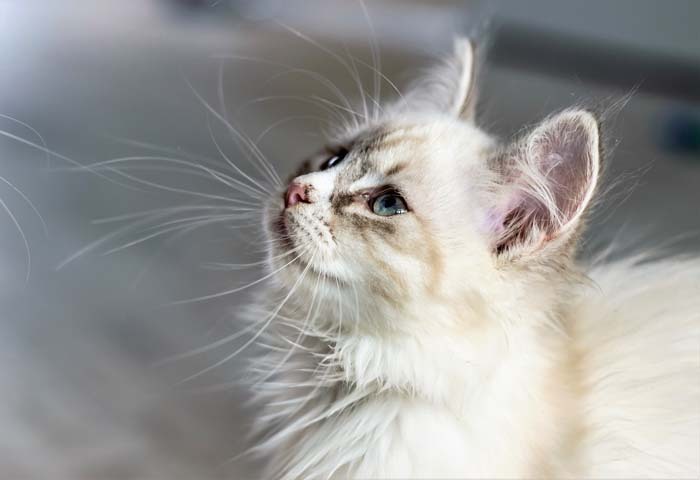 We read that the fur balls are lovingly looked after by a non-government cat rescue group (which helps to neuter and feed them). Volunteers leave lots of kibble piles for the kitties to eat, and there are plenty of rocks for the felines to shelter under or sunbathe on. But, we discovered, the kitties don’t like to be petted. Old San Juan also has some lovely independent boutique shops. Jewelry, souvenirs, clothing, arts and crafts. You name it. You’ll find it. We poked our heads into some stores. But without room in our suitcases (we packed light), we resisted the urge to buy, deciding only to collect memories of this trip. 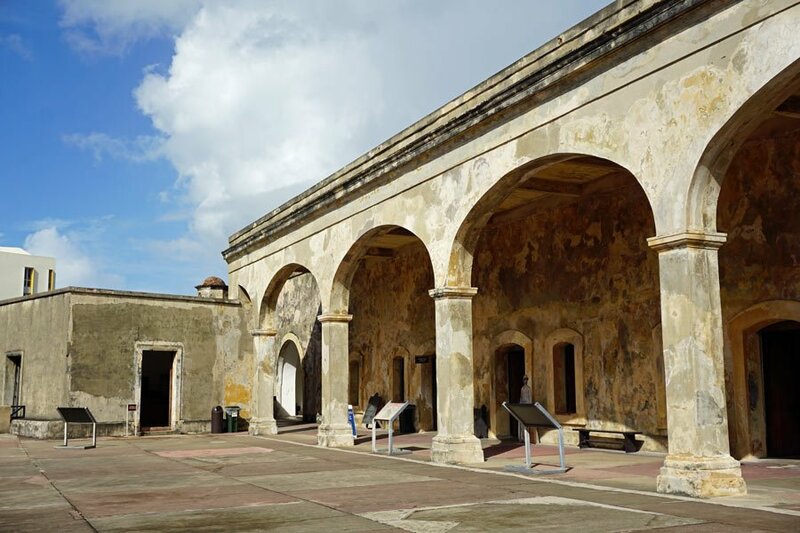 Here’s an interactive Google map showing the location of El Morro in Old San Juan. Zoom in or out to see what you want. 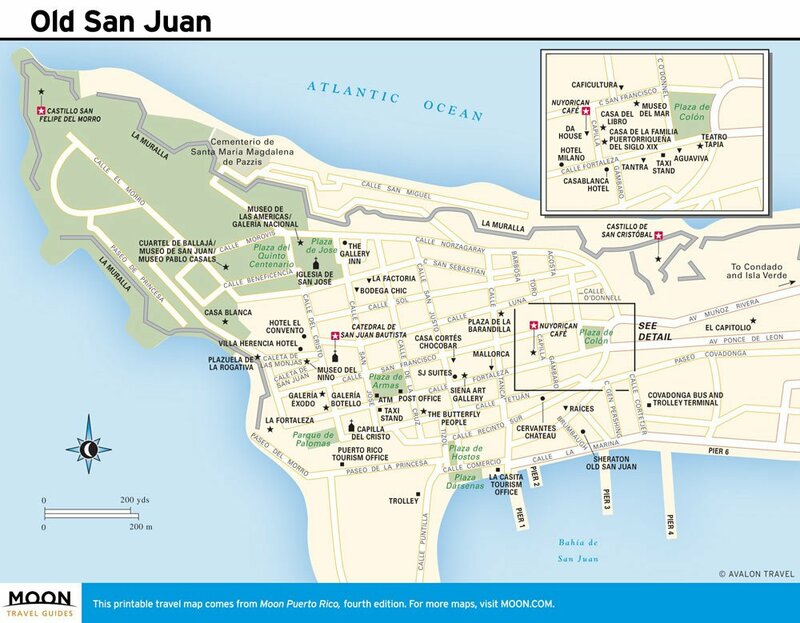 Here also is a good map of Old San Juan that you can print off as a PDF from your computer (courtesy Moon Travel Guides). 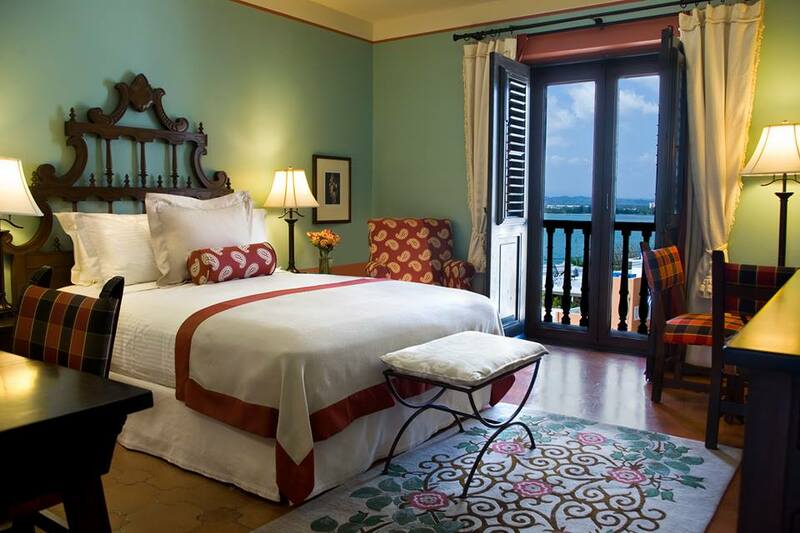 Where to stay in San Juan? 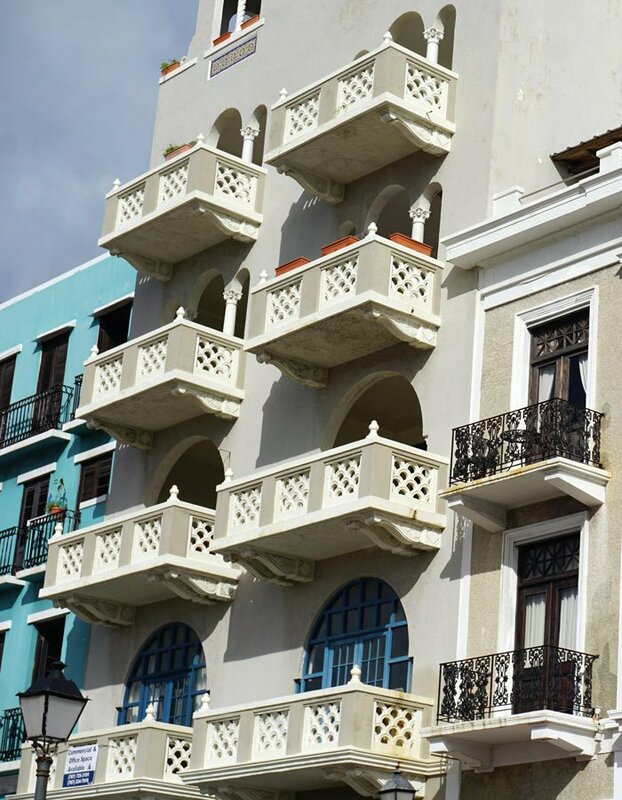 We unfortunately dithered about whether to stay on in San Juan after our cruise – had we known at the time that San Juan was so ready to receive visitors again we definitely would have tacked on a few days in the city! 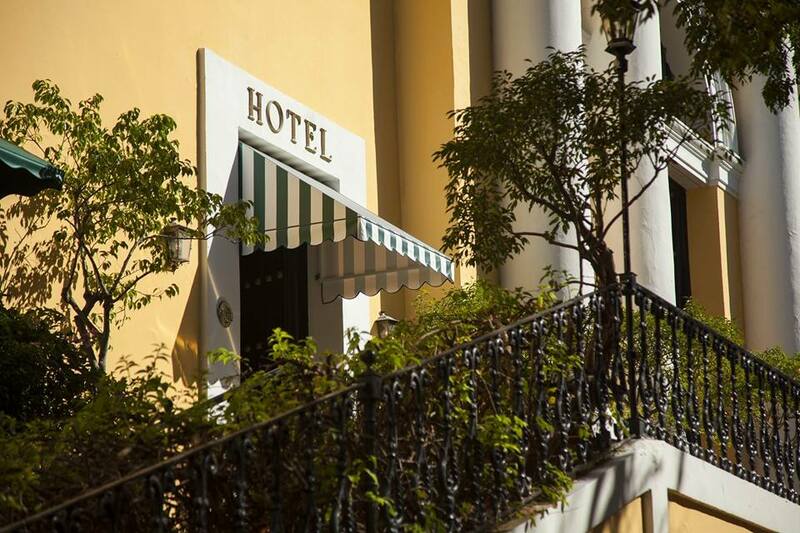 On our guided walking tour, we stopped in at El Convento, a 350-year-old Carmelite convent that’s been turned into a lovely boutique hotel. 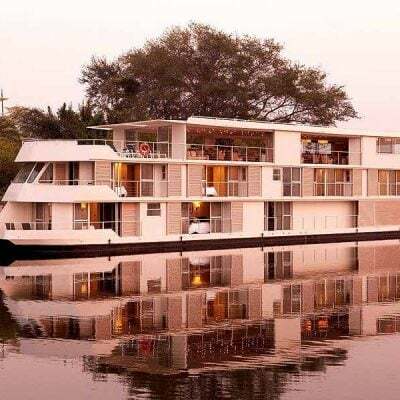 Smack-dab in the old city, it would be perfect if staying for just one night before or after a cruise. 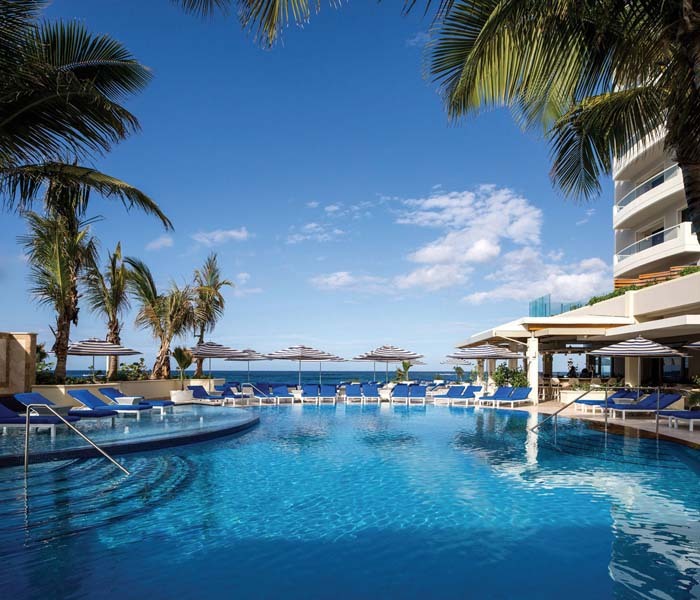 For two or more nights, we’d probably prefer to stay in a hotel by the sea, with a larger pool too. 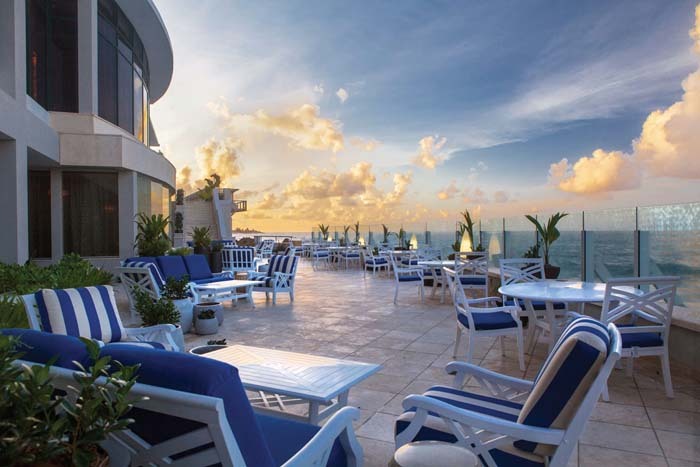 Originally built in 1919, the uber-luxurious Condado Vanderbilt is now open again and shining like new after its post-hurricane restoration. It looks gorgeous! Like this post? 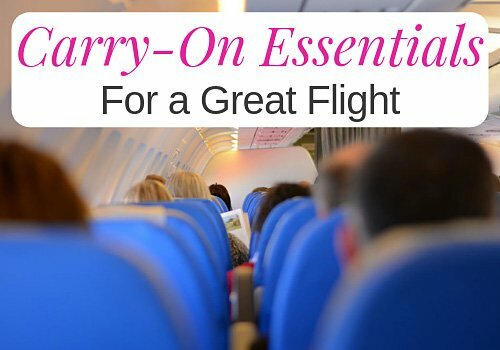 Then pin it to your Pinterest board for others to see too! 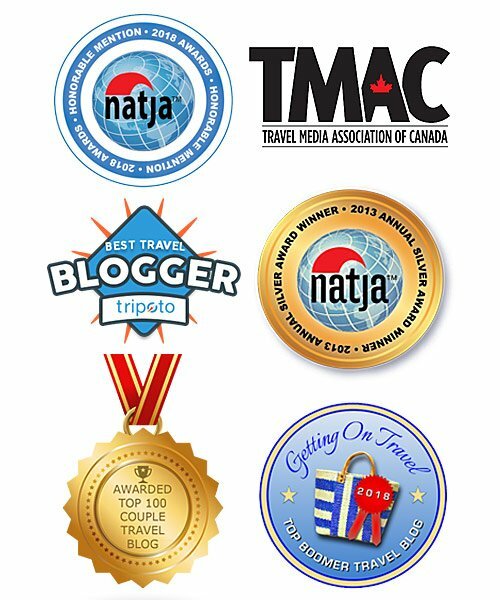 Where else to visit in the Caribbean? Glad you like it. 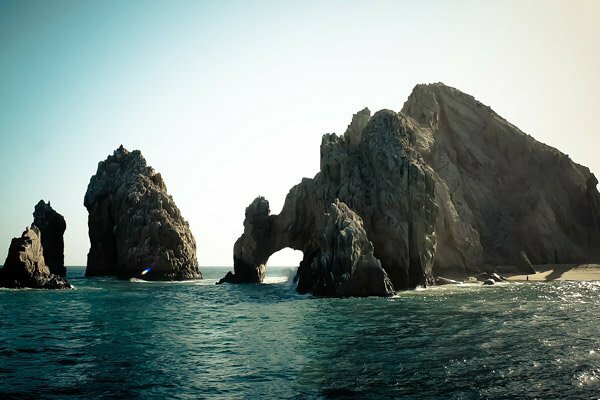 It’s important people know that many of the hurricane-damaged Caribbean islands are back to normal (or almost there). Janice and George, really enjoyed reading this article. 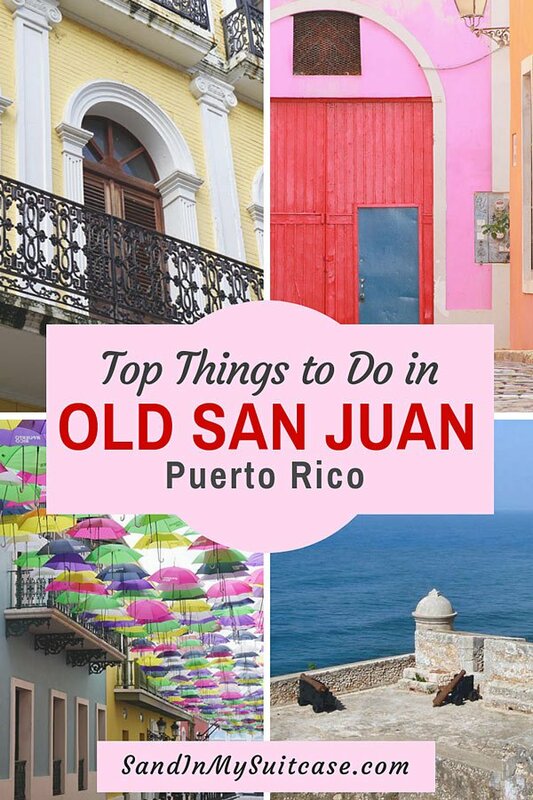 I would definitely love to visit San Juan! I recently read a Facebook post from a young woman concerned that she couldn’t visit San Juan due to the damage of hurricaine Maria. If I see something like that again I’m going to direct them here. 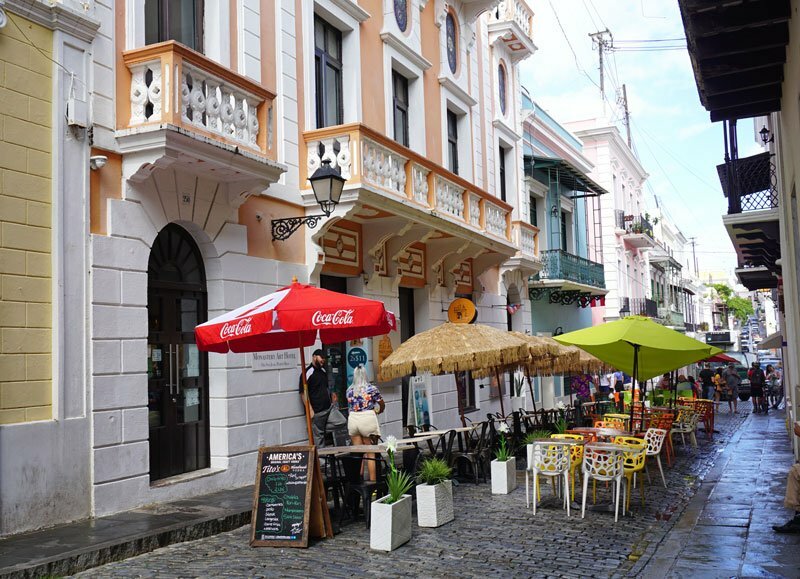 Puerto Rico needs our tourism dollars more than ever. There’s still a perception among many people that Puerto Rico is not ready to welcome tourists. We thought that too before going! 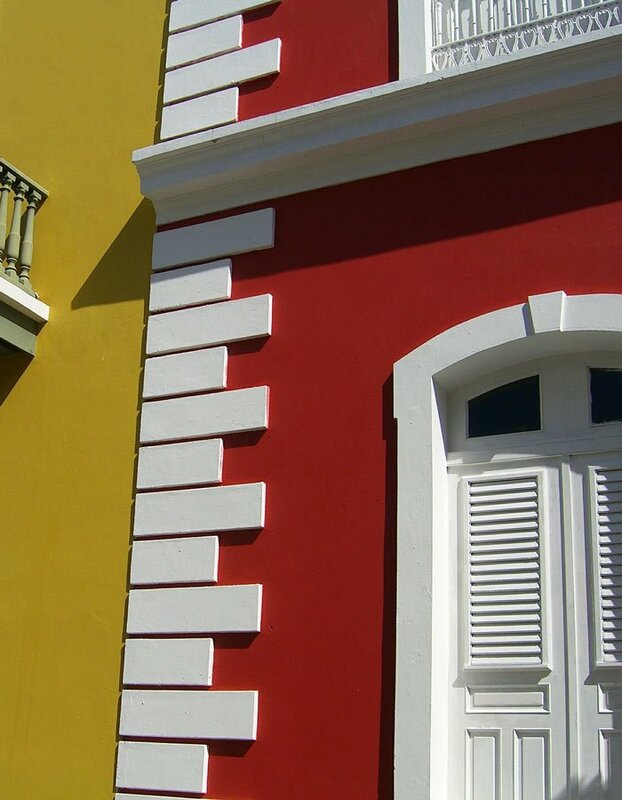 We can’t speak from personal experience about the rest of Puerto Rico, but we can certainly say that Old San Juan is all dressed up and waiting with open arms — and it’s a beautiful place to visit :-). What an inviting post! I want to return to Puerto Rico!